The other day there were whole ducks at Costco. It’s not every day that you pick up a whole duck to cook up for dinner, but the price was not to be passed up — $14 for a 4 pound birdie seemed like a total steal. Humanely butchered and also kosher, we picked up three and quickly walked to the check out. Because we don’t have a deep freeze, orchestrating the proper positioning of those ducks in the freezer took much more time than I ever imagined. But it was totally worth it. Roasting a duck isn’t a quick thing. For a little birdie, slow and low is the way to go. Start by removing the innards from the duck. You can do wonderfully delicious things with the liver, but that’s a post for another day. Give your duck a quick wash in cool water and remove any feathers if neccesarry. Prepare your roasting pan by lining with two layers of tin foil. Yeah, you want to save that duck fat — really, you do. 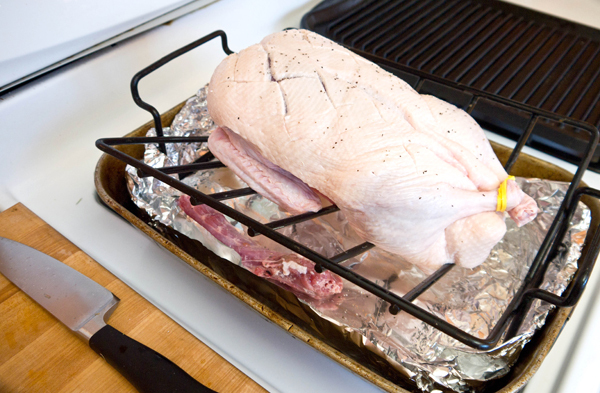 Now place a turkey rack in that pan and give it a good coating of oil. 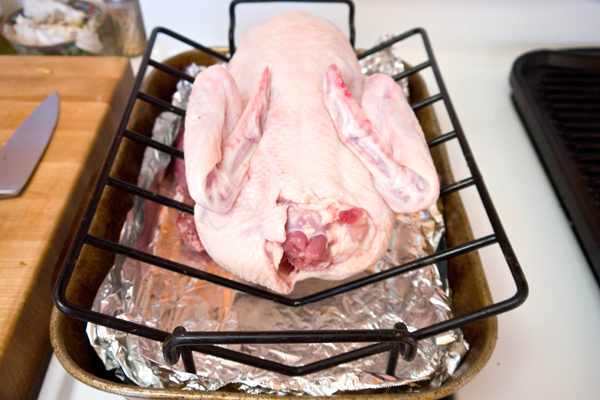 Tuck the wings under the duck, place it on the greased rack, and give it a quick sprinkle of salt. I decided to stuff my duck with a quartered orange and a couple of smashed cloves of garlic. Truss the legs to keep that birdie pristine. 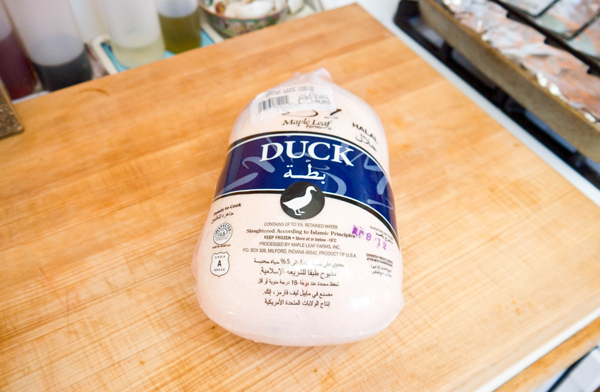 Use a very sharp knife to poke the duck all over the place. We’re not talking stabbing, just a nice decent jabbing. 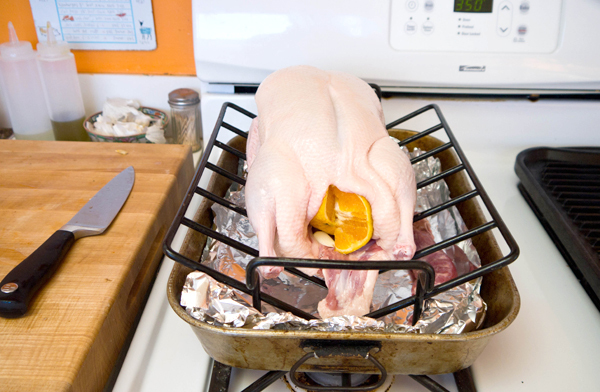 This helps release the fat from the skin so you’ll have a nice, crisp skin when that duck is finished roasting. 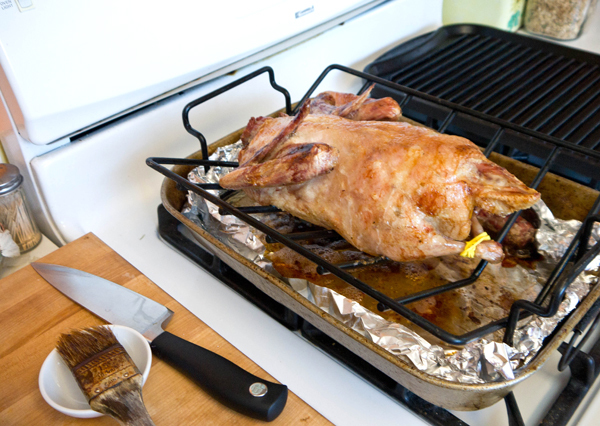 Pop that duck in the oven and set the time for one hour. 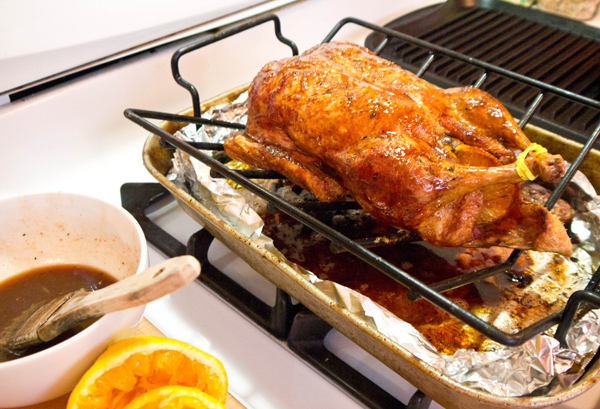 Take the duck out and baste with its own drippings. Carefully turn, poke, baste again, and then roast for another hour. 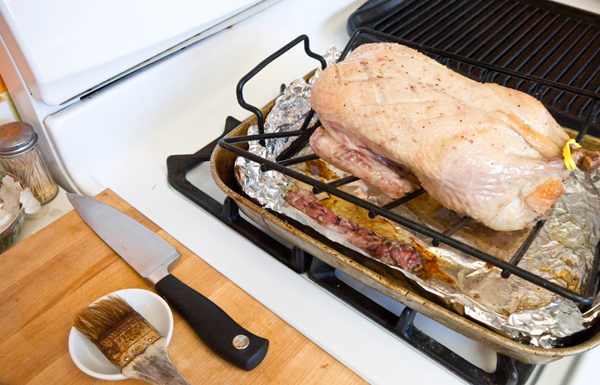 Take the duck out and baste. Carefully turn, poke, baste again, and then roast for another hour. Take the duck out and let sit for a moment. Now is the time to decide on your flavor profile. 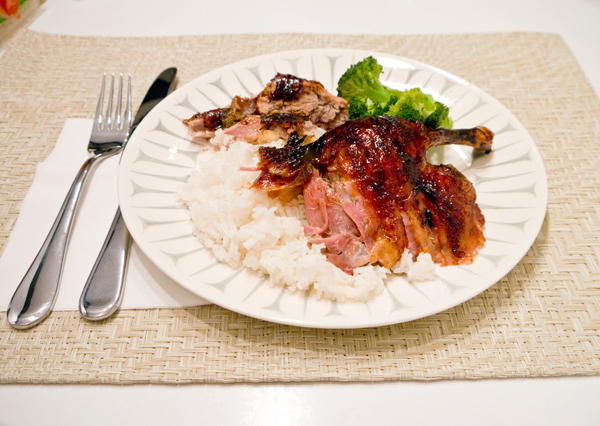 If you are wanting a Peking duck kind of flavor, baste on some duck sauce or soy sauce and have a great time. But what tastes even better is mixing together you own tasty coating. I squeezed an orange, mixed with 1 tablespoon honey, 1 tablespoon balsamic vinegar, 1 tablespoon ketchup, a touch of soy and Worcestershire sauce, and a dash of salt and pepper. Give your duck a big basting and then toss in the oven for another 2o-mintues or so. You can take your birdie out and check its temp and give another basting. Your bird might need up to an additional hour of cooking at this point, so just check back often. It’s suggested that the leg joint temp should read 175F, but if you’re around 165F or 170F, pull that duck and let it rest for a few minutes. 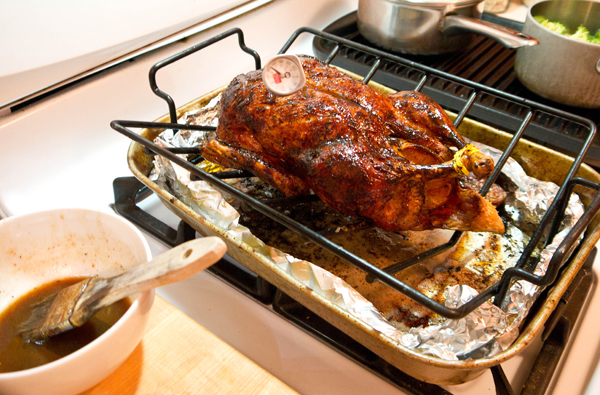 Give your duck at least 10-minutes to set before you start carving. While you’re waiting you could make a lovely sauce from the fat, steam some broccoli for a side, enjoy a glass of wine…. Carve your bird and serve with whatever you love.